Los Angeles’ transit history often reveals something brand new: a map we never knew existed, an angle to a story that helps us connect the dots, or new information from the past that informs planning our future. While the first bus rapid transit system was launched in Curitiba, Brazil in the early 1970s, plans for a local BRT were actually laid out a quarter century earlier…and more than 50 years before we launched Metro Rapid or the Orange Line. 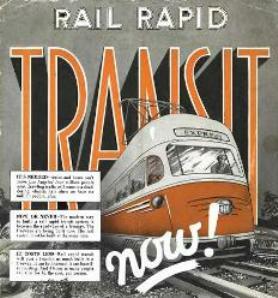 The 1948 Rail Rapid Transit Now! campaign’s plan for building a comprehensive rail system in conjunction with freeway construction never materialized, but it set in motion other events in Los Angeles mobility for decades to come. The full story can be found on the Primary Resources Blog produced by the Metro Transportation Library and Archive. Wow. the Future has left us behind the times! As I’ve long suspected, 25 years behind how things should be and 50 years behind how things could’ve been. Way to go, L.A.!